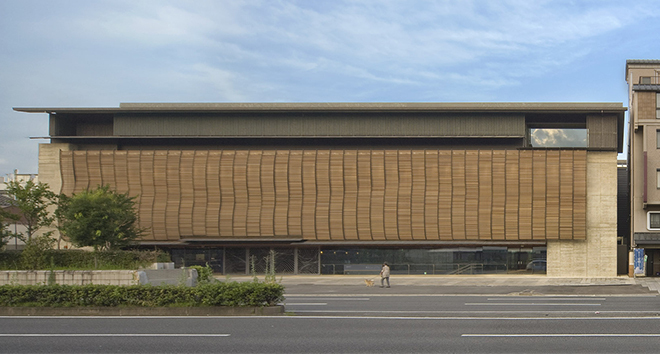 Ryukoku Museum is a significant addition to the vibrant cultural scene of Kyoto. Situated right in front of the Nishihonganji Temple, a UNESCO World Heritage Site, the museum is dedicated to furthering knowledge and interest on Buddhism through utilizing a wide and comprehensive range of cultural artifacts in the handsome new building, which opened its doors in April 2011. The museum is affiliated to Ryukoku University, an educational institution established in 1639 within Nishihonganji Temple, and was established as part of the commemorative projects to celebrate the 370th anniversary of the founding of the university. With the core mission to promote world-class research, Ryukoku University offers ten graduate and ten undergraduate courses and is recognized as a vibrant environment for comprehensive educational and research activities. One of the major projects at the museum is the reproduction of Bezeklik cave painting project. 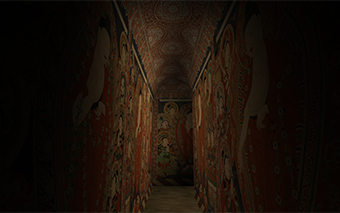 The research, led by Professor Okada Yoshihiro from the Faculty of Science and Technology and Digital Archives Research Center and partners from the Faculty of Literature and Silk Road Research Center, involved the study and digital reconstruction of the magnificent Bezeklik cave murals found in the temples on the outskirts of Turpan in the Xinjang Uyghur Autonomous Region in China. Bezeklik, which means ‘a temple where the paintings are’ in Uyghur, was an extensive cave system adorned with vibrantly coloured religious imageries. However, by the beginning of the 20th century, many of the murals were virtually destroyed through weathering and vandalism. 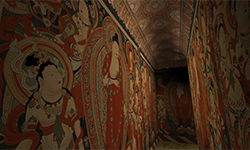 Using digital technology, the team has recreated the original splendor of the mural by creating an exhibit in the Ryukoku Museum where visitors are able to walk through a life-size digitally reimagined corridor of the Number 15 cave at the site. Ryukoku Museum is widely recognized in Japan as a comprehensive museum on Buddhism. 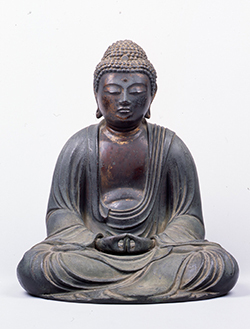 Centering on Japanese and other Asian Buddhist artifacts, the museum has a permanent exhibition and curates approximately two themed special exhibitions each year. The themes not only cover the ideology of Buddhism that influenced vast stretches of Asiatic regions including Japan, but also explores its impact in other traditional fields for a more holistic investigation, including religious practice, pedagogy, painting, sculpture, architecture, and vernacular manners and customs. Buddhism with its roots traced to India from some 2500 years ago has been a positive force for many centuries and in countless regions to improve the lives of their people. In a climate where warfare and ethnic troubles are reaching new heights, there is an increasing need for altruism rather than exclusion to prevail. At Ryukoku Museum, attempts to promote the value of altruism through the teachings of the Buddha is echoed in the museum’s collection and research. The permanent exhibition is, therefore, on ‘Thoughts and Culture of Buddhism – From India to Japan’. 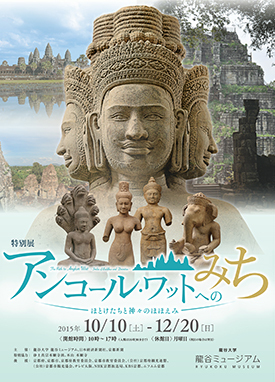 The show embodies an ambitious and holistic approach to appreciating Buddhism in an accessible way. Using artifacts including sutras, sculptures and paintings from the Ryukoku Museum’s vast collection, the museum caters to the interests of both specialists and the general audience. Outstanding examples include the 2-3rd century standing Boddhisatva from Gandhara, seated gilt bronze Amida from the Kamakura period (1185-1333) and the Kamakura period hanging scroll with the image of a standing Amida from Shinnyōdō temple. Previous special exhibitions include the premier commemorative exhibition ‘Shakyamuni and Shinran’ held in six parts from April 2011 through to March 2012. The exhibition not only celebrated the opening of Ryukoku Museum, but also marked the 750th anniversary of the death of priest Shinran, who founded Shin-Buddhism. The museum is open between 10am to 5pm on Tuesdays through to Sundays* to welcome visitors inspired by Buddhism.